The Peekaboo trail is located in the Needles District of Canyonlands National Park. The trail crosses sandstone ridges and traverses along benches above deep canyons enroute to Peekaboo Springs and Trail Arch. Along the way hikers are treated to a continual awe inspiring display of towering pink and white sandstone cliffs and spires. 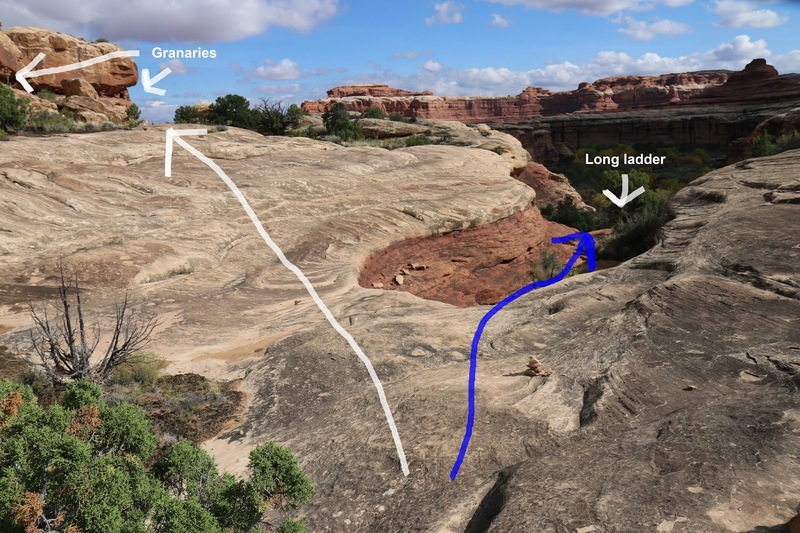 The adventuresome hikers will enjoy several challenging slickrock scrambles as well as a couple of metal ladders that make difficult sections of trail more manageable. Several ancient granaries near the trails end remind visitors of the areas ancient inhabitants. The trail comes to an end at Trail Arch where the Salt Creek Canyon trail continues for another 22.5 miles. 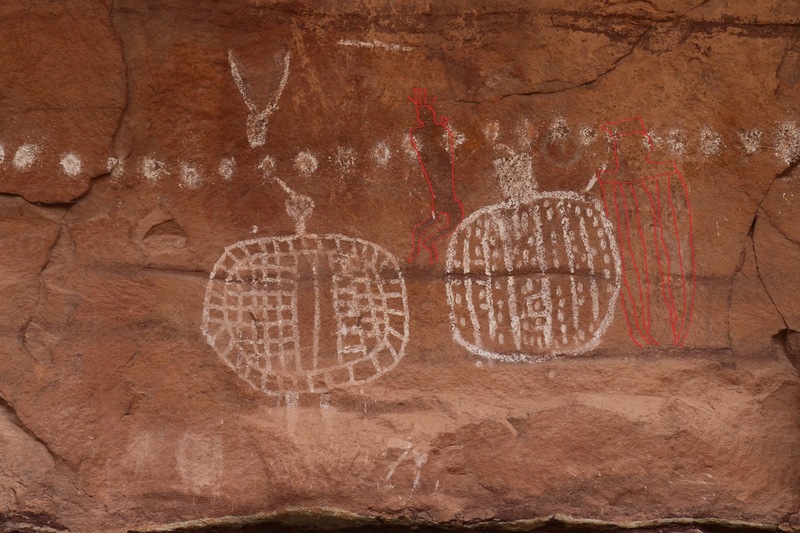 Also at the trails end there are many pictographs, some of which are thousands of years old, for hikers to contemplate before retracing the route back to the trailhead. Backpackers can obtain a free backcountry permit and camp at one of the sites at Peekaboo Springs. To get to the Needles District of Canyonlands National Park drive south out of Moab on Highway 191 for 40 miles, or north out of Monticello for 14 miles, turn west onto Utah 121 and follow the paved road for 35 miles. The Squaw Flats trailhead is several miles further into the park in Loop A of the campground. The first 2.6 miles to Peekaboo Springs follows the Lost Canyon trail. All of the trail junctions are clearly marked with signs that include distances to the next point or intersection. 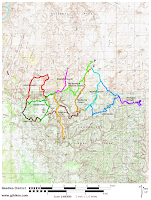 Even with the trails being well marked though it is still advisable to carry along a map, which you can pick up for free at the Visitor Center, that shows all of the interconnecting hiking trails in the Needles District. As the trail departs from the trailhead it comes to its first intersection where the trail to Big Springs Canyon breaks off on the right. Continuing to the left toward Lost Canyon and Peekaboo Springs the next intersection comes up at the 1.1 mile point from the trailhead. 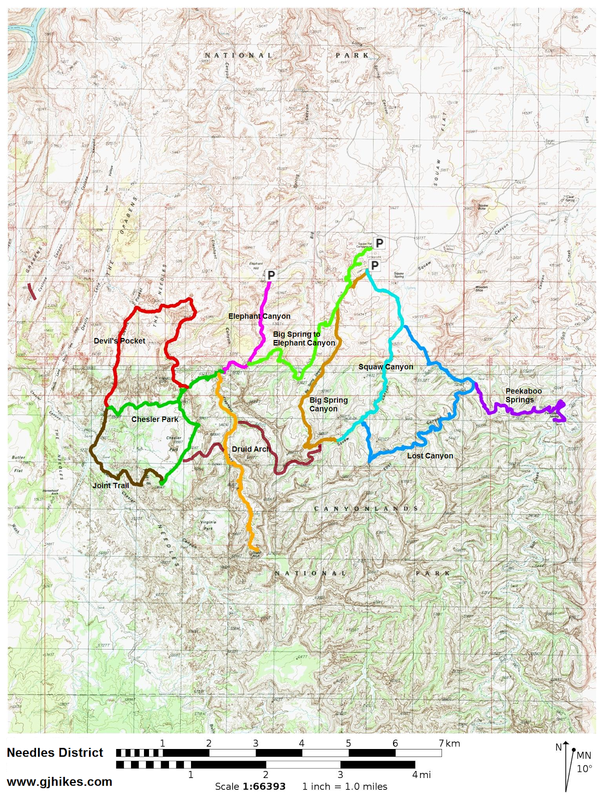 This time it is the Squaw Flat trail that breaks off on the right while the Lost Canyon and Peekaboo trails continue to the left. From the Squaw Canyon junction the trail crosses a few small ridges that are separated by stretches of easy hiking sandy sections. About 1.7 miles from the trailhead the trail climbs some slickrock that can be slightly challenging for some. Hikers who can get good traction on the slickrock and avoid patches of sand tracked onto the rock by other hikers can simply walk right on up. Others will find themselves making contact with the rock using both hands and feet to get enough traction for the scramble. We are only talking about a couple of spots here that are both less than 10 feet in length. After scrambling up the short sections of slickrock the trail crosses a saddle that overlooks a branch of Lost Canyon. The views in all directions are so spectacular that they border on being spellbinding as you stand in awe and take them in as though enjoying one of Mother Nature's most special treats. From the saddle the trail follows the slickrock bench to the left and then makes a short drop down to a lower bench via the first of the two ladders. As the trail continues around the lower bench it becomes much narrower but never so narrow as to feel overly risky. As on all slickrock though caution should be exercised when it is wet or icy. Over the next quarter mile the trail will eventually end up in the narrow wash in the bottom of the canyon. The trail continues in the bottom of Lost Canyon where at the 2.6 mile point the Peekaboo Springs route branches off on the left. As the Peekaboo trail ventures off on its own it first passes the LC1 backcountry campsite after which it begins scrambling up some loose rock and sandstone benches that lead to a long water worn cascading trough that is an easy hike when conditions are dry. At the top of the trough the trail tops out once again on a bench that sits between high cliffs that tower above it and deep canyons that loom below. From this point the trail trappes around several of the lower canyons branches that pierce the massive volumes of sandstone where the higher cliffs form impressive cirques. This part of the route is broad and makes for easy hiking. There is one short section where about 10 feet of the trail crosses a narrow spot that slopes toward the precipice below that is easily passed with a little caution. The trail has one of its Peekaboo moments where it passes through a window in a ridge and comes out on the other side and continues around the next bowl in the same fashion as before. After passing through the window in the cliff and arcing around the next canyon the trail passes through a gap in another cliff and eventually ends up descending the hogback of a ridgeline where the sandstone transitions from red to white as the trail drops from one geological era to the next. From there the trail levels off a bit passing some interesting caves and overhangs as it heads east toward the point of the cliff. Just before the trail begins its next descent there is a granary that can be spotted off to the left nestled under an overhang maybe a hundred yards away. A short side trip reveals several more granaries of various sizes and in different degrees of ruin. If you head off in that direction for a closer look be sure to remember not to disturb these ancient relics. Also remember that it is illegal to dig around them or disturb the area in any way and if you spot any suspicious activities to report it to a ranger. The granaries are easily viewed from the ground below. Back on the main route the trail follows the drainage a short distance and comes to a long ladder that provides passage down a joint in the cliff to the canyon below. It can be a little awkward at this point with a backpack. Especially if you try turning around at the base of the ladder to scramble the last little bit down the rocks. All in a days worth of fun though. Once the trail ends up in Salt Creek Canyon it follows along the cliffs to the right until it comes to Trail Arch where several panels of pictographs adorn the cliffs. 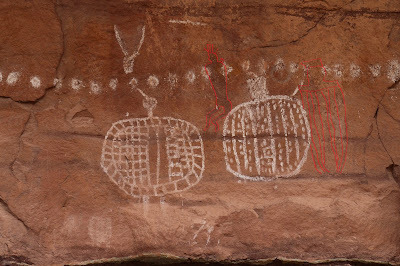 The main images are of a couple of large white shields but closer examination reveals some faint Barrier Canyon style images that were painted in red at a much earlier time. On both sides of the arches opening there are numerous painted hands that were made using two distinct methods. From here the Salt Creek Canyon trail begins as you pass through the arch. A little exploring reveals a few more pictographs along the west side of the cliffs that look to be from the same period as the white shields. In the canyon below the arch are several of the Peekaboo Springs camping sites as well as a vault toilet. This is the turnaround point for this post although when we were here we logged a couple more miles as we explored the first mile or so of the Salt Creek trail before heading back. The Peekaboo Springs trail makes a fun exploration of the eastern side of the Needles District. The scenic views are enough by themselves to make the whole hike worthwhile. The various obstacles along the way like the challenging slickrock, ladders and the trails other natural features coupled with the granaries and pictographs move the trail easily into the 5 star category. Due to the rough terrain, hikes in the Needles District tend to be a bit more strenuous than what many people are used to. It often pays to get an early start and to bring plenty of water and trail snacks. The early bird will also stand a better chance of finding a parking spot at the trailhead. If the lot is full you might consider parking at the trailhead in Loop B and begin hiking from there. It will add a little over a half mile to your round trip distance. No matter where you begin from the Peekaboo Springs trail is sure to please. If you would like to see it for yourself then all you have to do is 'Take a hike'.